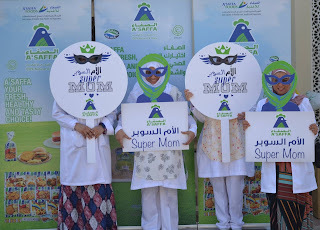 Mothers and staff at the Al Khoud Medical Centre in Oman witnessed a special Mother’s Day pampering organized by the Sultanate’s largest fully integrated poultry, snacks and allied foods company – A’Saffa Foods on the momentous occasion of Omani Mother’s Day 2018. شجّع فريق الصفاء للأغذية الأمهات من الطاقم الطبي بمركز الخوض الصحي للحديث عن سبب اختيارهن للصفاء للأغذية عن غيره من العلامات التجارية. كما قام الفريق بتوزيع أطباق صحية من الصفاء كالبرجر وغيره من المنتجات الصحية التي تأتي تحت مظلة الصفاء للأغذية للطاقم الطبي والمرضى المراجعين. كان للأمهات أيضاً حضور في ركن التصوير والذي أتاح لهن ألتقاط بعض الصور والذكريات الجميلة لجهودهن في جعل كل بيت بيتاً سعيداً وباعتبارهن الأمهات السوبر. A’Saffa Foods’ team encouraged mothers within the medical centre’s staff to share their experiences and A’Saffa’s loyal customers and why they chose the brand over any other in their homes. The staff and patients at the Centre were also treated to a sumptuous spread that saw healthy favourites such as burgers and several other popular products from A’Saffa Foods umbrella. The ladies also had an exciting photo-booth installation that was a complete hit with social media savvy mothers. Moreover, all the mothers were bestowed the title of ‘A’Saffa Super Mom’ for their constant efforts, spoken and unspoken, in make their homes a happy place. تؤمن الصفاء للأغذية بأن يوم الأم هو ذاك اليوم الذي يجب على الأمهات أن يحضين فيه بكل الاهتمام لكل ما يقدمنه من جهود. إقامة هذه الفعالية في المركز الصحي كان سبيلنا لنضمن أن لا تفوّت الأمهات هذه الفرصة لأخذ استراحة والاستمتاع بقليل من الدلال مع الوجبات الخفيفة والمقبلات الصحية واللذيذة لجميع أفراد العائلة. A’Saffa Foods firmly believes that Mother’s Day is the one day of the year when all mothers should have the opportunity to unwind and be recognized for all the rewarding and energy consuming efforts that goes into being a parent. Hosting this event at the Medical Centre was our way to ensure mother’s don’t miss out on this opportunity to take a break and enjoy a bit of pampering by indulging in our fresh, healthy and tasty snacks and savories - that are not only good for their health, but also for that of their children and families. ترتكز "الصفاء للأغذية" على الأمهات والأطفال والعائلات والأصدقاء ، وتحول اللحظات اليومية إلى احتفالات لذيذة، وهي تعكس باستمرار روح الشركة وفلسفتها "الأطعمة الصحية، الصحة والسعادة"، وتسلط الضوء على قيم الأسرة في جميع حملات الاتصالات والمبادرات. Grounded in mothers, children, families, and friends and turning everyday moments into tasty celebrations - A’Saffa Foods constantly encapsulates the corporate ethos and philosophy of A’Saffa Foods “Healthy Food, Health and Happiness”, and highlights the values of family in all of its communication campaigns and on-ground initiatives. تجدر الإشارة إلى أن دجاج الصفاء يصل إلى منافذ التسوق القريبة منك، وهو طازج من المزارع يومياً، ويتم فحصه باستمرار لضمان السلامة والجودة في جميع مراحل التصنيع والتعبئة وغيرها من العمليات ذات القيمة. عندئذ فقط يتم نقله إلى محلات البقالة والسوبرماركت والمطاعم الراقية، وفي النهاية يصل إلى طاولة المستهلك. والأكثر من ذلك هو أن دجاج الصفاء يتم تربيته في بيئة آمنة وخالية من الأمراض ومغذى طبيعياً (بالذرة الصفراء والصويا)، مع عدم وجود نفايات حيوانية معاد تصنيعها أو أي بدائل علف أخرى، ولا هرمونات نمو، هو طازج، حلال، صحي، وطعمه مميز. It is noteworthy that A’Saffa chicken reaches shopping outlets near you, fresh from the farms daily and are continually checked for safety and quality throughout processing and packaging, and other back-end value processes. Only then are they transported to grocery stores, supermarkets, high-end restaurants, and finally make their way to the end-customer’s table. What’s more is that A’Saffa chicken are raised without cages in bio-secured, disease-free environment, natural fed (yellow corn and soya), with no animal waste recycled by-products feed or any other feed substitutes, no growth hormones, and is fresh, real halal, healthy with signature tenderness and taste as guarantee.